Hollywood actress Gwyneth Paltrow and ex-footballer Jamie Redknapp are among stars who have donated clothes for a charity sale at London's Selfridges. Redknapp, Little Britain star David Walliams and TV presenter Denise van Outen will also manage stalls. Redknapp's wife, Louise, organised the sale with models Yasmin Le Bon and Lisa Barbuscia for charity Mothers4Children. The charity sale will take place in the car park of the store's flagship outlet in Oxford Street until 1600 GMT. Former Eternal singer and TV presenter Louise Redknapp donated 12 bags of clothes, shoes and bags and said planning the sale has been "good fun" but "lots of hard work". A total of 45 stalls will sell clothing, household items and memorabilia. She said: "My husband's slightly mortified that I'm selling 90% of his suits. "Some of the key pieces I'm giving include a Givenchy dress, which I wore at the Elle Style awards last year, and a Fendi Spy bag, which is a really beautiful bag. It's not something I give away easily, but it's for a good cause." 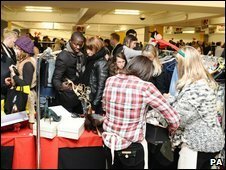 Other celebrities who have donated for the charity sale are Denise van Outen, Jemima Khan, Jodie Kidd, Sophie Ellis-Bextor and Davina McCall.